I must have been living under a stone or on some obscure part of the internet, for I had not heard of the webcomic Poorly Drawn Lines (http://poorlydrawnlines.com/). However after reading 'Life is weird. Embrace it.' I thought I should give it a try. 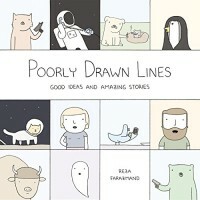 It's a nice collection of (very) short comics and some short stories/essays. I figure it must be like reading the blog. However, and I can't judge this, but I was wondering it all the same, I'm not sure how extra this book gives you if you already follow the blog. This being said, I quite enjoyed myself with it. Most of it was not LOL-material, but I did smile from time to time and let some of my friends read comics since we were all sitting in the same train when I was reading it. Some parts were just weird, but then I can't say that's not what was promised.